This arrived yesterday. 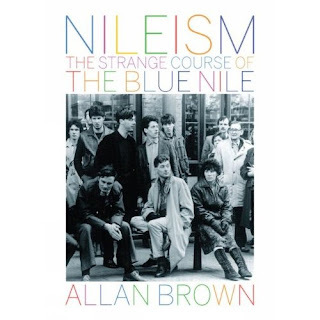 I don't own many rock biographies, but Nileism seemed essential, not least because the story of The Blue Nile simply hasn't been played out in public or the pages of the music press. I've been a fan of the band for twenty five years, and I still don't know much beyond the barest essentials: that they're from Glasgow, that there are three of them, that they had some connection with Linn, that they produce music at a truly glacial pace. Four albums to date, in 1984, 1989, 1996 and 2004 respectively - and that's it. Nor is there much prospect of new material, judging by the state of affairs between the band members. Never mind, it was fantastic while it lasted. I saw them live, once, and they did Tinseltown in the Rain twice in the same evening. That's the best song, that one. Not the best Blue Nile song, mind, but the best song. I can't believe that up until a week or so ago when John Scalzi put a vid of "Over the Hillside" up on his blog I don't think I've heard of the Blue Nile. Now you've posted this I am strangely compelled to seek out more. Good stuff. Thanks. I think they were vaguely on the cusp of being slightly well known at the time of the second album, Hats (from which "Over the Hillside" came) but after that it was a long slide back into dwindling sales and relative obscurity. The quality didn't decline, though. "Hats" was released around the same time as Kate Bush's "The Sensual World"; I distinctly remember buying both LPs on the same day and being almost paralysed into indecision as to which to listen to first. Happy days! I got turned onto the Blue Nile by Steve Hogarth (singer for Marillion). He was right - great band and definitely "musician's musicians" (kind of like Marillion, as it turns out). Thanks for pointing out this book, Al. A great band, they were quite big here in Edinburgh at the time. I always thought the first two albums were the best and have spent many, many a night with a glass of wine, the lights low, and A Walk Across The Rooftops. I remember hearing Tinsletown in the rain a few times on the radio and being fascinated by it. I didn't actually discover who's song it was until I heard a track from "Hats" afew years later, which I bought and still love to this day. It's the perfect album to put on in the car, as loud as possible, while driving late at night. It's an album you can really loose yourself in while listening to it. I'd have to disagree about the best song ever (I think I'd probably have to go with one by the equally melancholic David Sylvian), but it is a very, very good one. I think I'll give the book a read, it sounds interesting, when I've finished the one I'm reading now, and while I'm waiting for your next one to arrive. You'll have enjoyed the recent Blackwood miners' institute gig - not that I was there, but the TV coverage on BBC Wales was excellent. Hopefully that'll be out on DVD at some point.